tombs than anyone is likely to be able to absorb. 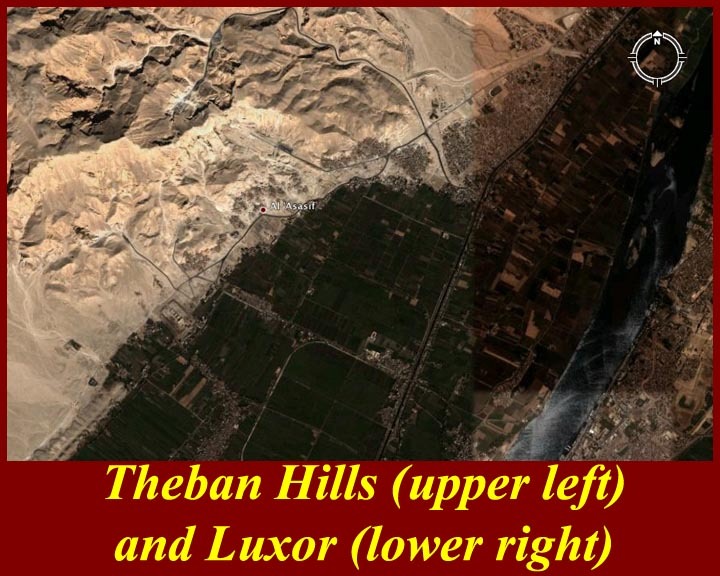 The Theban Mapping Project at http://www.thebanmappingproject.com/ has everything that is known about Thebes and its tombs and temples. Click on images or links for larger versions of the images. 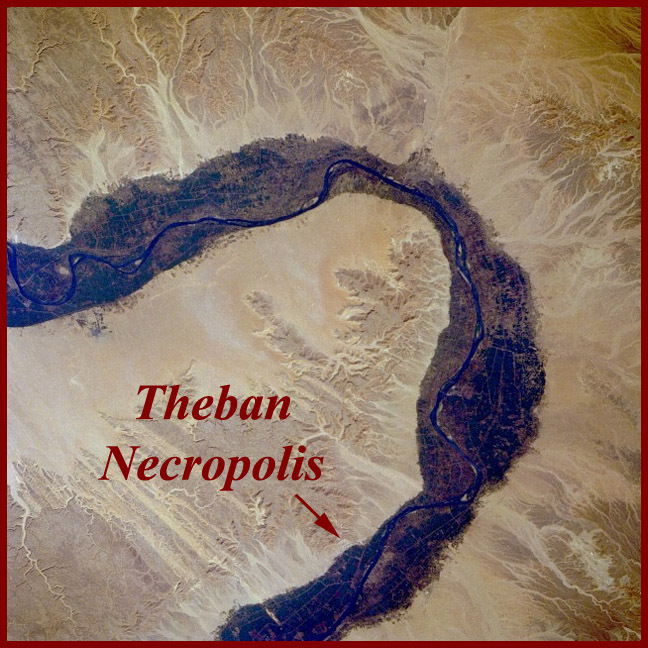 A series of images locates the major sites associated with the Theban Necropolis. 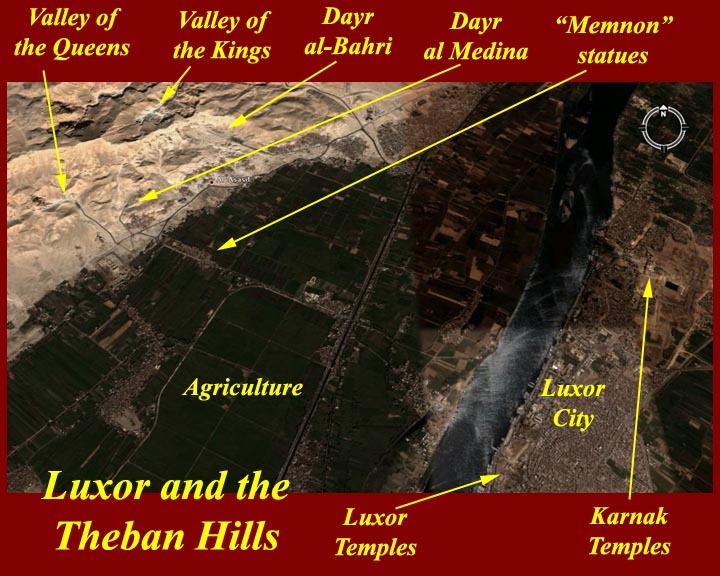 Two satellite images of the Dayr al-Bahri site, which has three large temple sites (Mentuhotep, Hatshepsut, and Thutmose III) and which was the site of a "mummy cache". 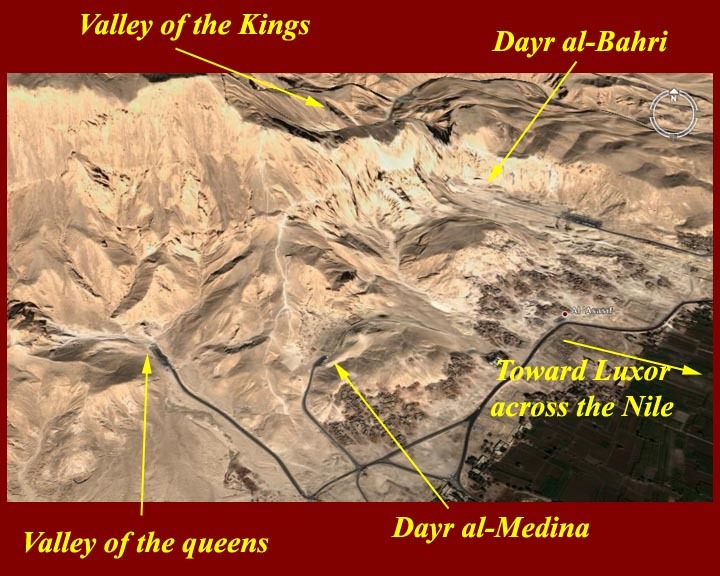 where mummies form the Valley of the Kings were restored and hidden. 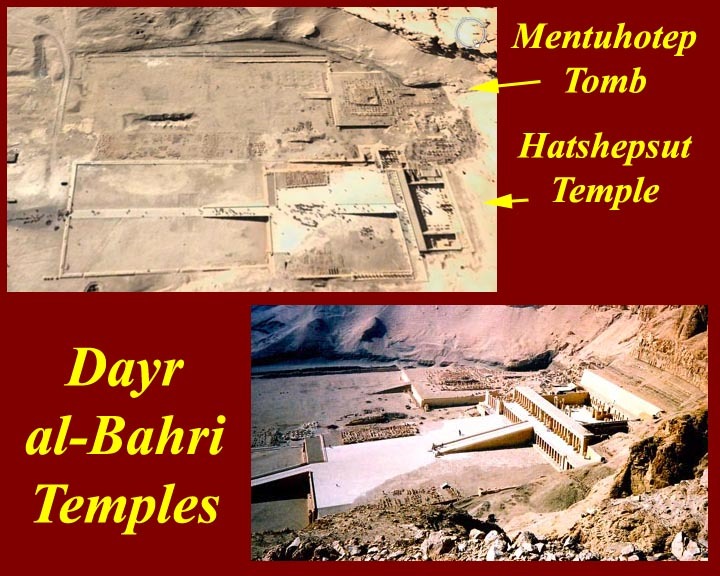 The three major Dayr al-Bahri temples: The southernmost and earliest temple (at the top of the first three images) us that of Mentuhotep, a Middle Kingdom Pharaoh of the 11th Dynasty. 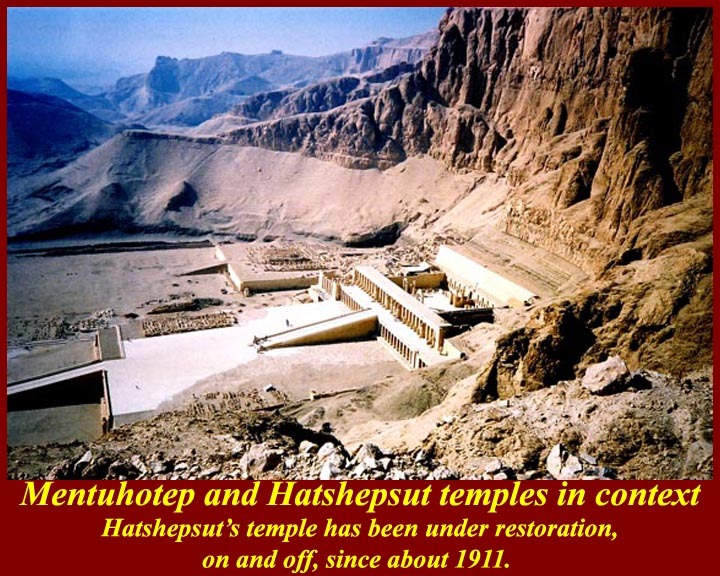 The northernmost and largest temple is that of Hatshepsut. 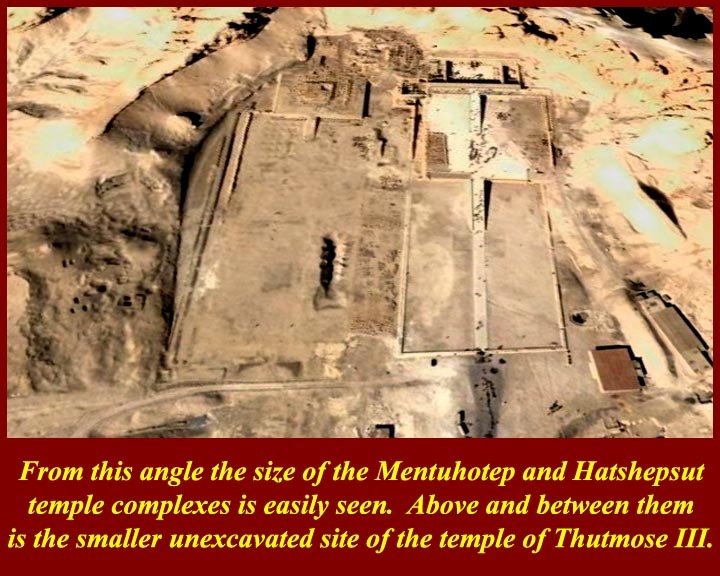 In between and slightly to the west is the temple of Thutmose III, whose efforts to blot out Hatshepsut are remembered with distaste and probably contribute to the lack of interest in excavating his temple. 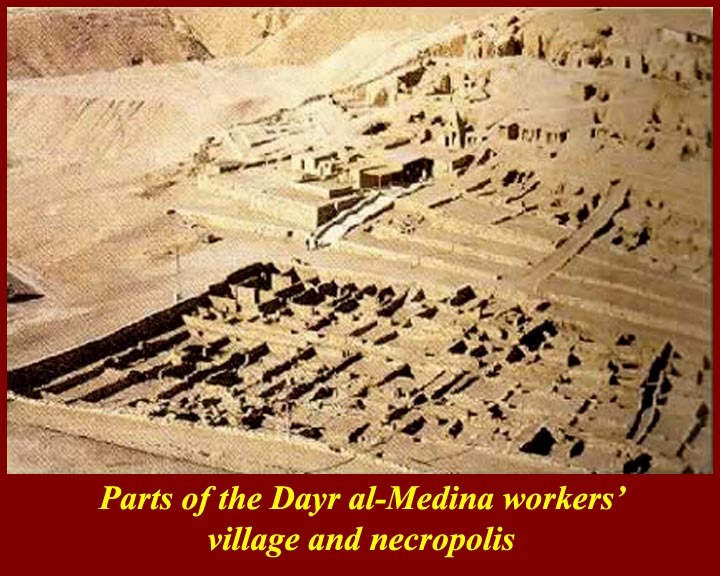 The Dayr al-Medina site is comprised of a the archeological remains of a village where lived the permanent workers who built, maintained, and guarded the tombs in the nearby valleys, their necropolis (later shared with some Theban nobles), a Ptolemaic temple that later became a Coptic Christian church (the "Dayr"), and the remains of some structures that may be quarters for seasonal workers. 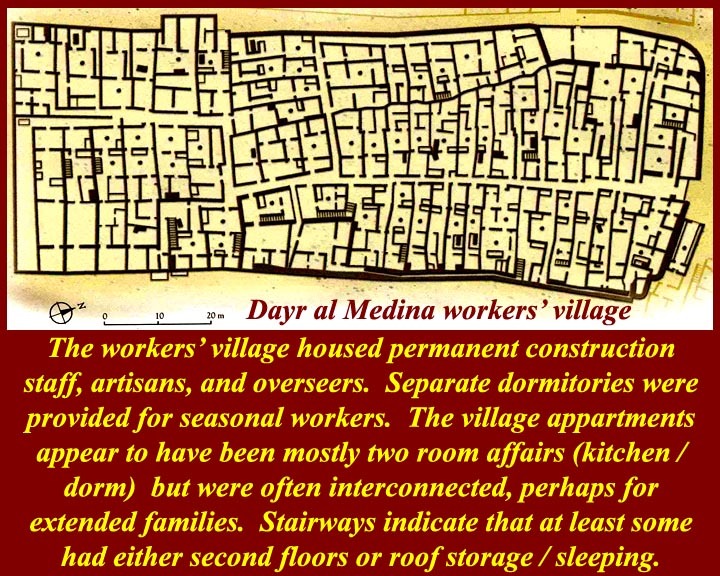 The workers' village at Dayr al-Medina had minimal amenities -- not up to the standard of urban Egypt of the time, but definitely better than rural villages along the Nile. The people who lived here would have been tomb building bureaucrats (some of whom would have been nobles), skilled artisans, and construction crew leaders. 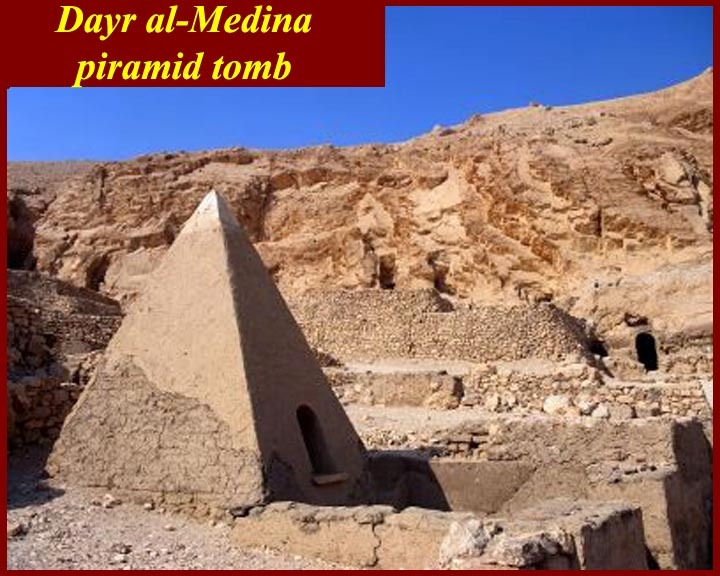 One of the advantages of living here would have been the ability to build tombs of their own near to the tombs of the pharaohs and queens and thereby to share in the blessings of the location. A real bureaucracy controlled the tomb building industry and the village, and, as would be expected, detailed records were kept. Some official letters were found in a papyrus cache in Dayr al-Bahri. 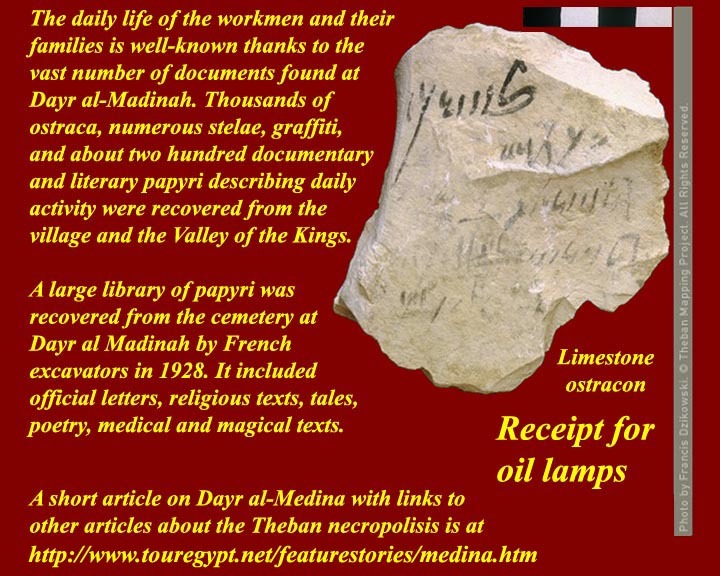 On a more personal level, people apparently expected receipts when they delivered tools or supplies, and the receipt were written on limestone chips generated by the tomb work. The workers took these chips -- their protection against accusations of theft -- back to their village quarters where very many of them were found by archeologists. The chips are valuable clues to the organization of the tomb-building and of town life. 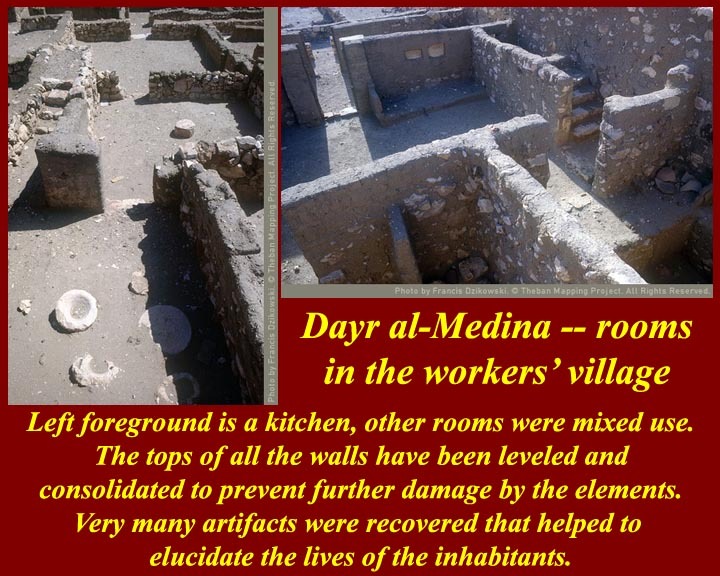 The Dayr al-Medina village was abandoned during the lawless days of the end of the New Kingdom, the Third Intermediate Period, and the Late Period: without central organization from Thebes there was no protection against raiding Libyans and others. 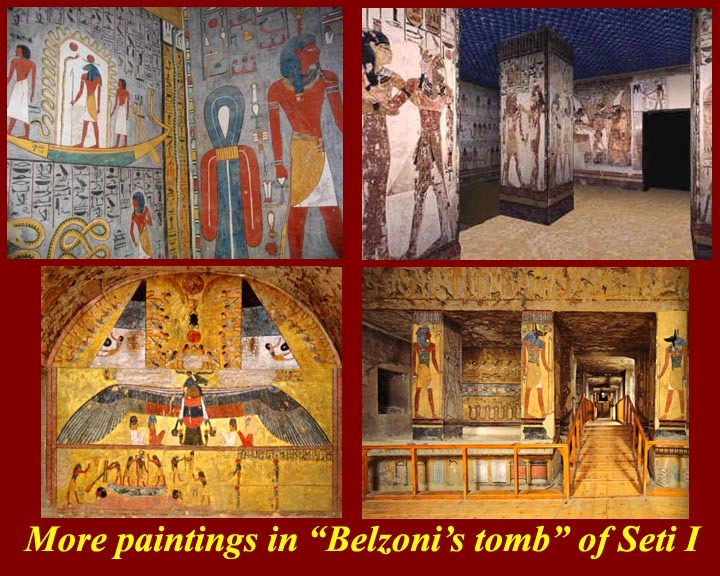 It was during this period that the tombs in the Valleys of the Kings and Queens were despoiled and that the Theban priests of Amun retrieved royal mummies, rewrapped them if necessary, and placed them in hidden caches. 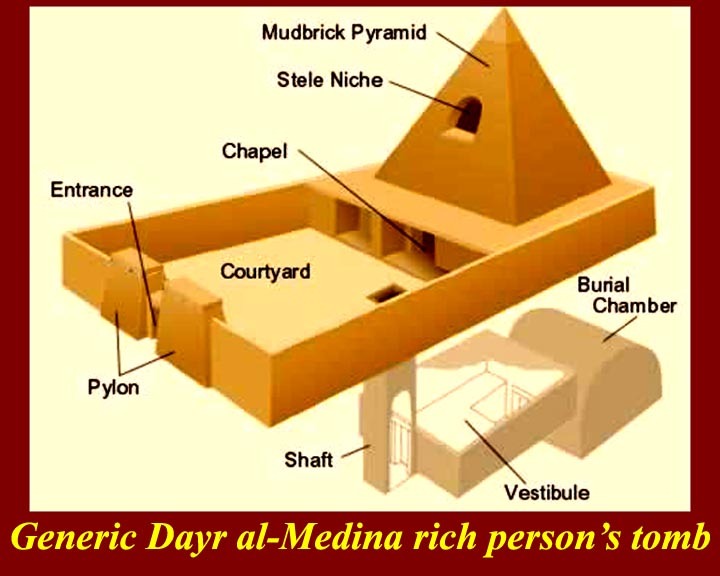 The Dayr al-Medina cemetery was also still visited. 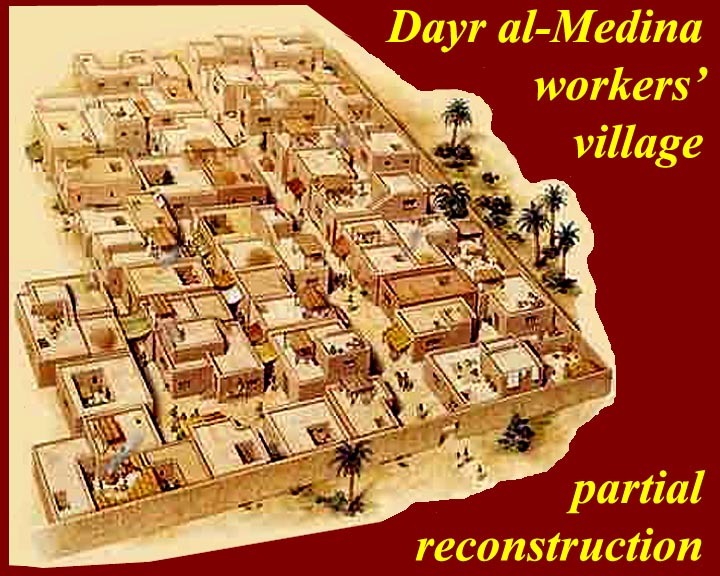 When order was finally reestablished the Ptolemies built a temple to the north of the abandoned village, and that temple was later used as a Coptic Christian monastery, the "Dayr" in Dayr al-Medina. 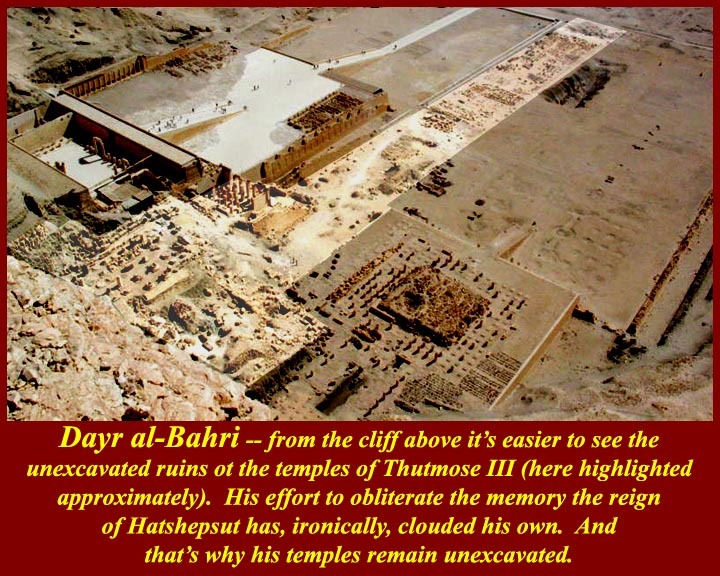 (There was also a monastery or "Dayr" on the upper terrace of Hatshepsut's temple at Dayr al-Bahri, but all traces of it have been removed by the restorers.) 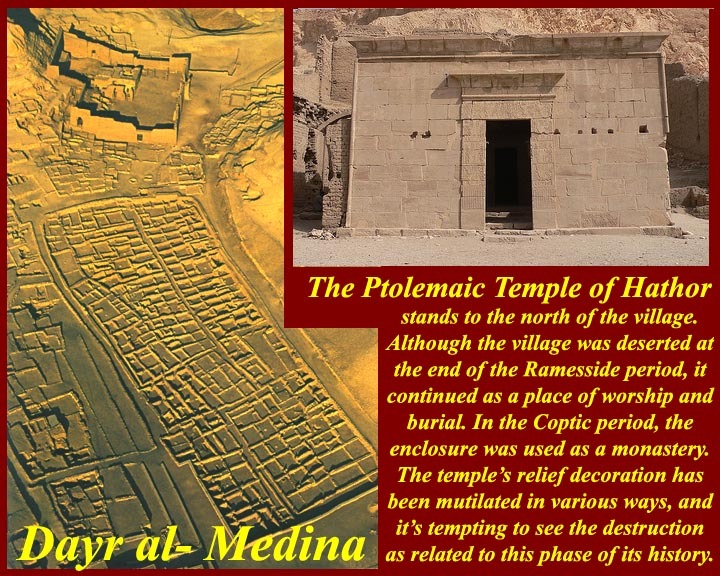 Most of the art in the Ptolemaic temple was defaced either by the Coptic monks or by later Islamic iconoclasts. 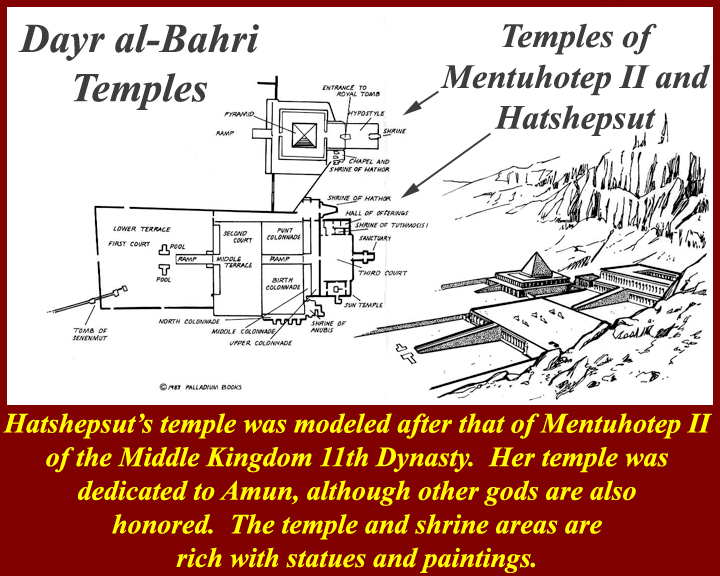 For more information on the temple see http://www.touregypt.net/featurestories/medinahathor.htm. 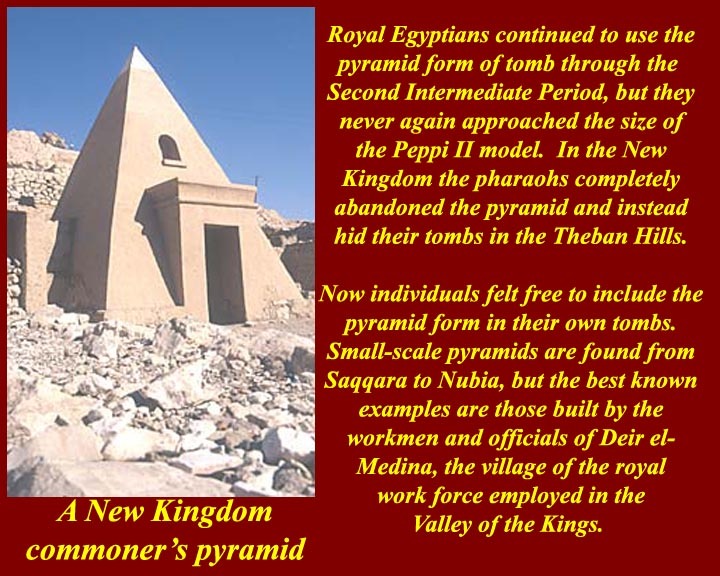 As noted in the unit on pyramids, the pyramid tomb form was adopted by non-royals as soon as the pharaohs abandoned it. these later pyramids had steeper slopes and might also have chapels inside -- things that would have been impossible in pyramids with greater upper mass. There was also usually a niche in the front wall for a funerary stele. 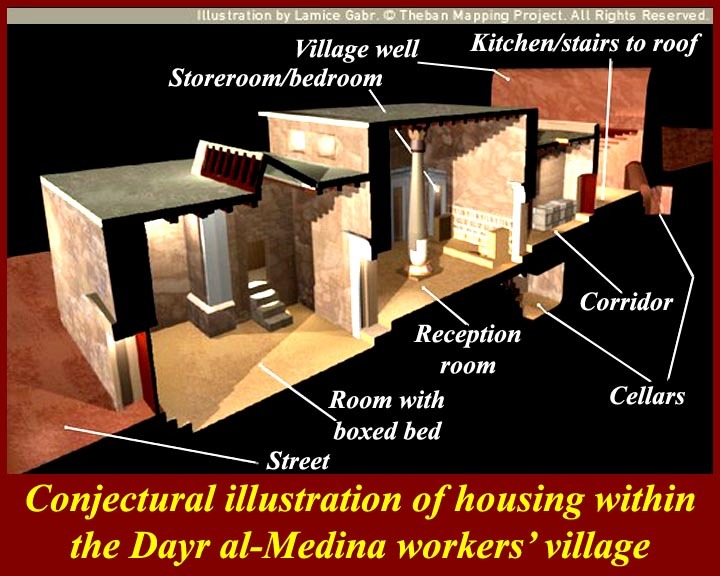 It is clear that the Dayr al-Medina artists didn't give their best work to the royals. 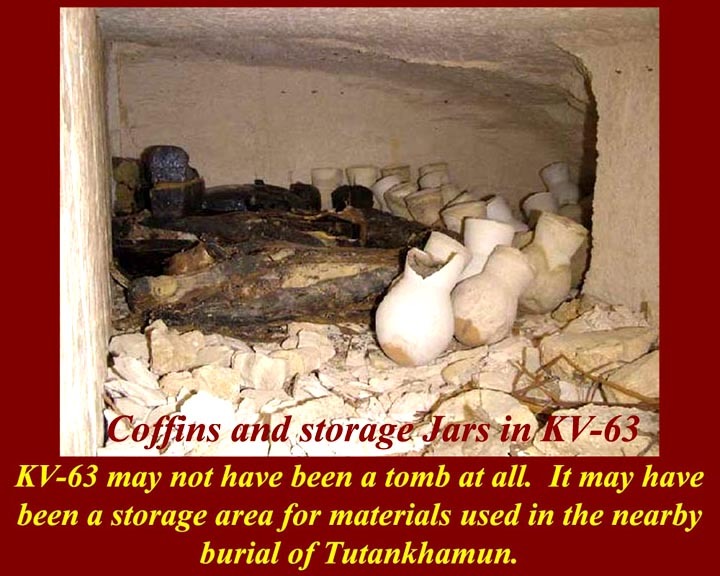 They saved it for their own tombs and for those of high paying officials and other rich people. 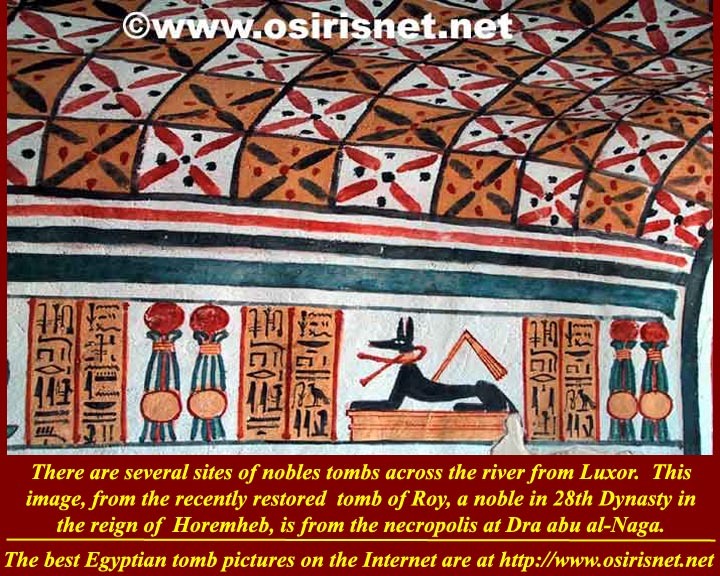 The best Egyptian tomb art is in the tombs of bureaucrats and nobles. 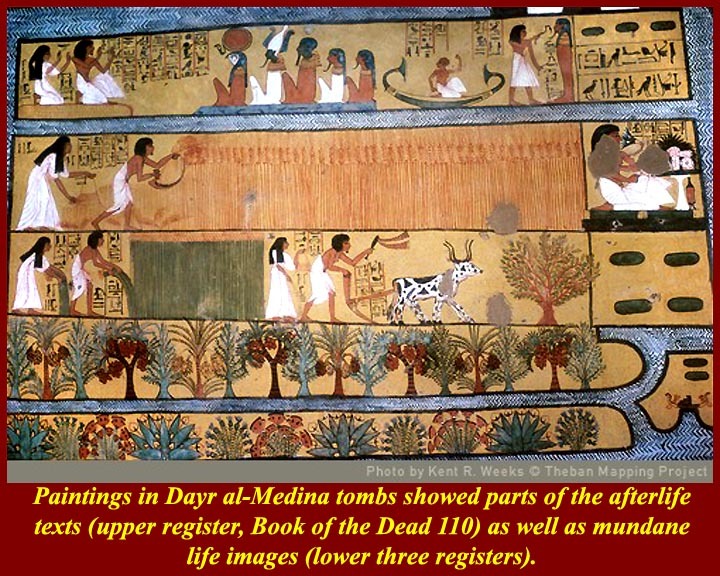 In addition, there is a greater range of subject matter in the non-royal tombs. 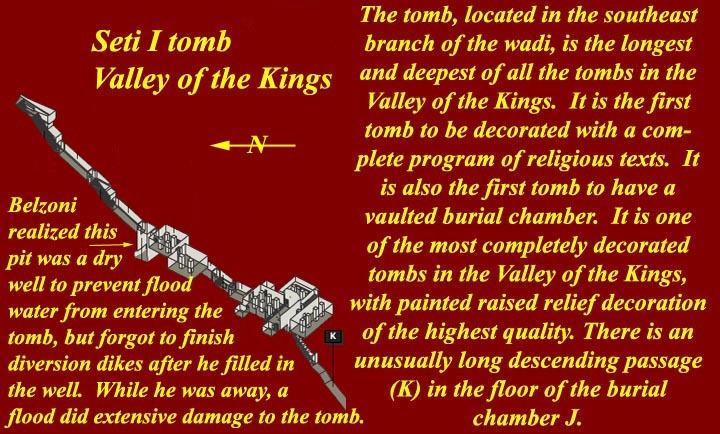 The royals were bound by religion to ensure that they passed all the afterlife tests so that they could be deified and then continue to be a conduit between the gods and their people, and they had to record their victories and accomplishments on the walls of their tombs. Non-royals had simpler afterlife duties and requirements, so they had room on their tomb walls for more mundane scenes. It's from paintings on the walls of the non-royal tombs that we get images of farm and river life. 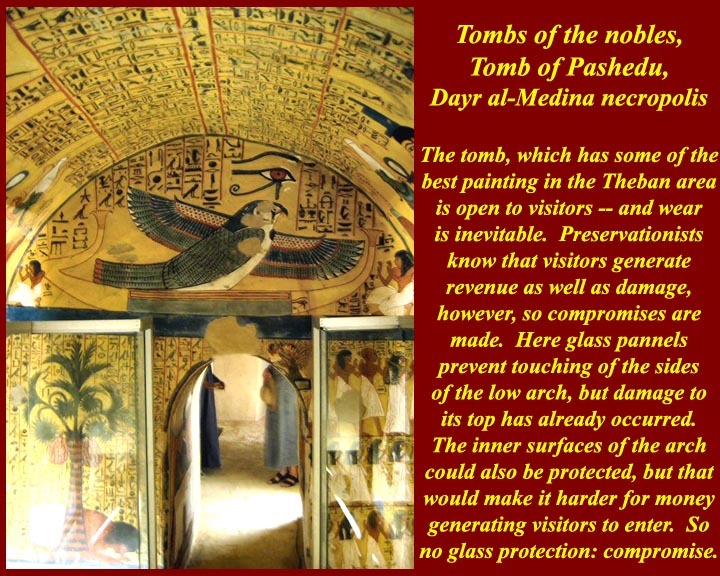 The tombs of artisans and nobles are intermixed both in locations and in categories -- this because some people who we would consider artisans achieved ancient Egyptian noble titles. 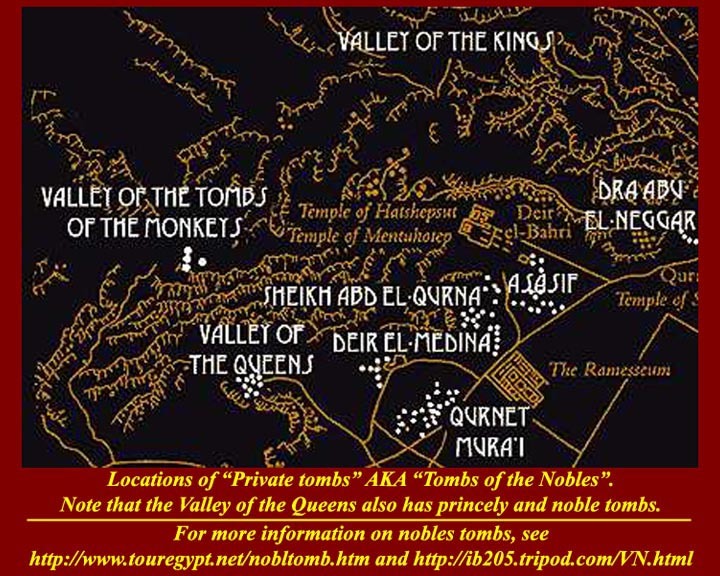 The tombs are spread through several areas on the Nile west bank opposite Luxor. 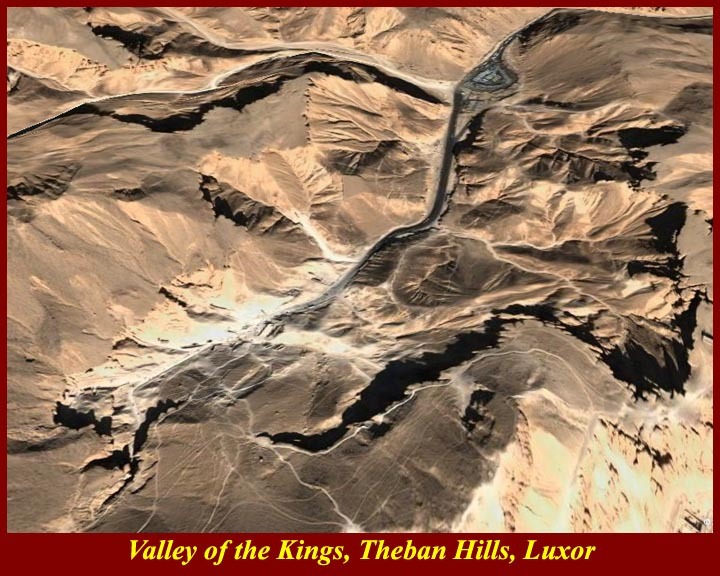 The Valley of the Queens is the site of over 90 tombs of royal wives, sons, and daughters from the 18th, 19th, and 20th Dynasties. 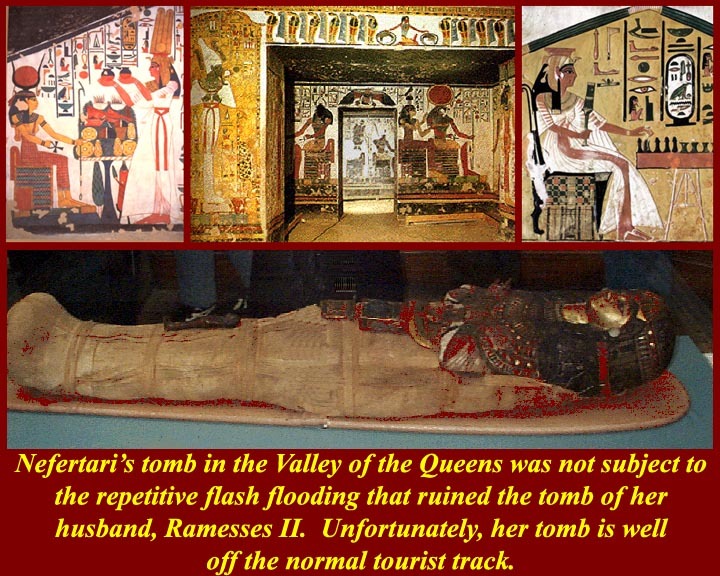 (Royal women of the 18th Dynasty appear not to have had one exclusive cemetery but were buried in many, often remote locations, as well as occasionally in the Valley of the Kings). 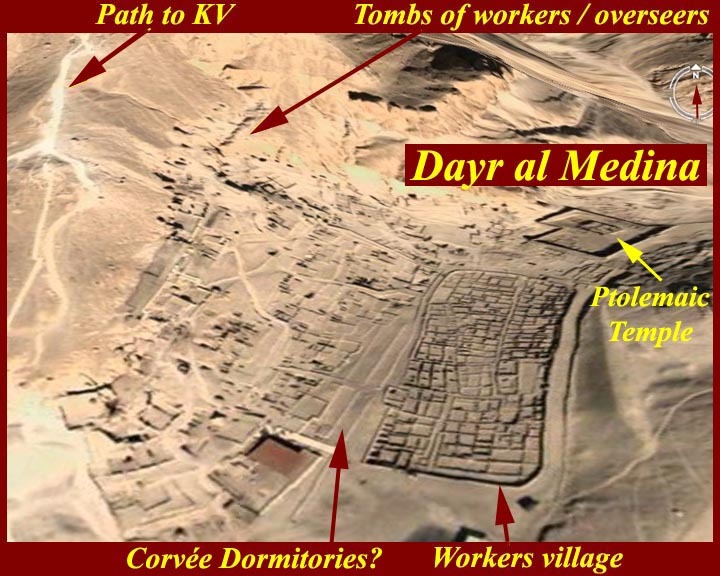 Early tombs lie at the northern 'mouth' of the valley, later tombs nearer its southern end. 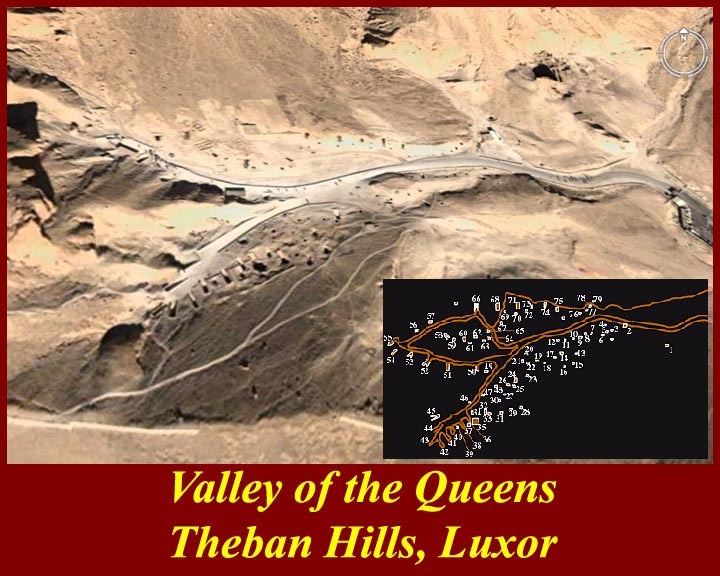 For more information on the Valley, see http://www.touregypt.net/queens.htm and http://en.wikipedia.org/wiki/Valley_of_the_Queens. 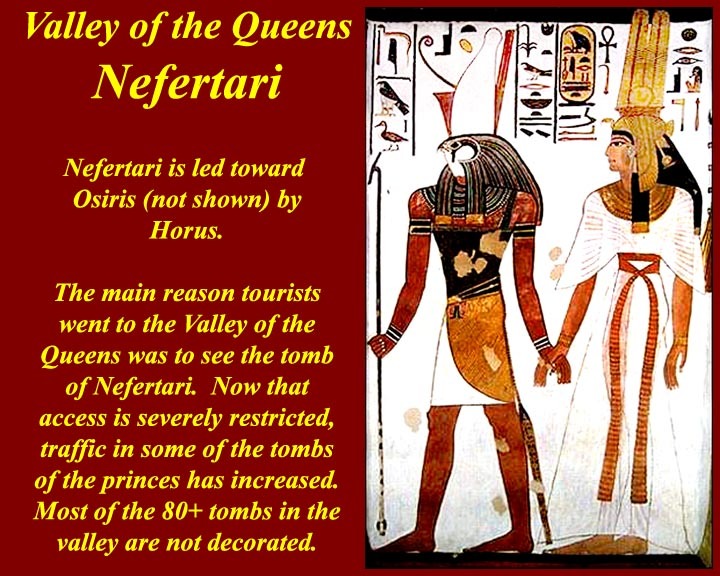 Nefertari's tomb has always been one of the major attractions in the Valley of the Queens, but now, unfortunately, it has had to be closed because of its popularity. After the Getty Museum restored the tomb visitations were limited to 150 persons per day, and even that was too much for the fragile wall paintings -- the space is too tightly closed and human moisture, just like any other moisture, is highly destructive. (One site I know in Rome is limited to ten persons per week for a ten minute visit.) 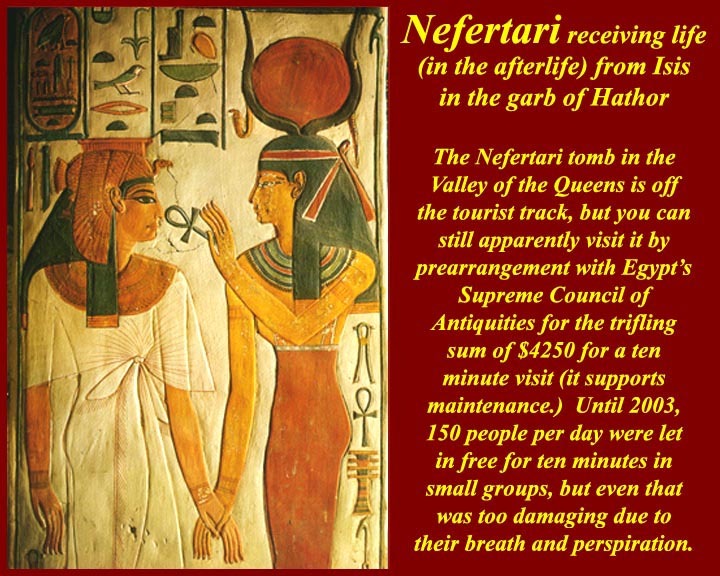 At any rate, Nefertari's tomb can now only be visited by pre-arrangement with the Supreme Council for Antiquities and at a cost of over $4000 per visitor. 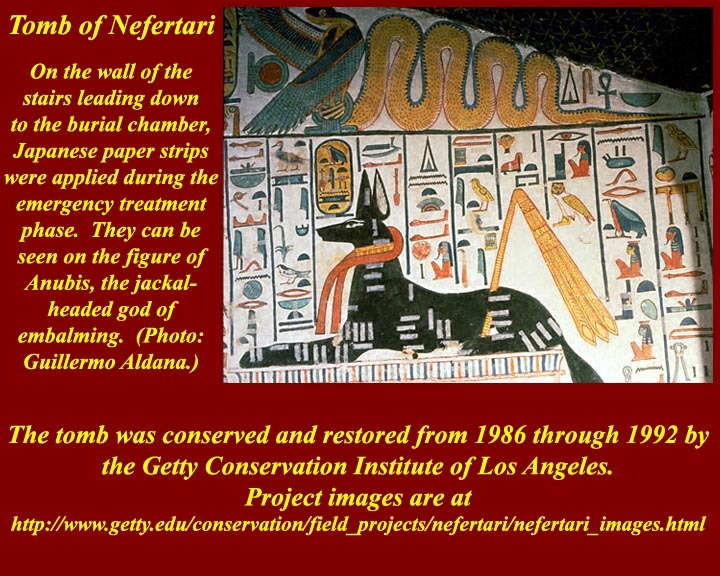 For information on the Getty restoration project, see http://www.getty.edu/conservation/field_projects/nefertari/nefertari_images.html. 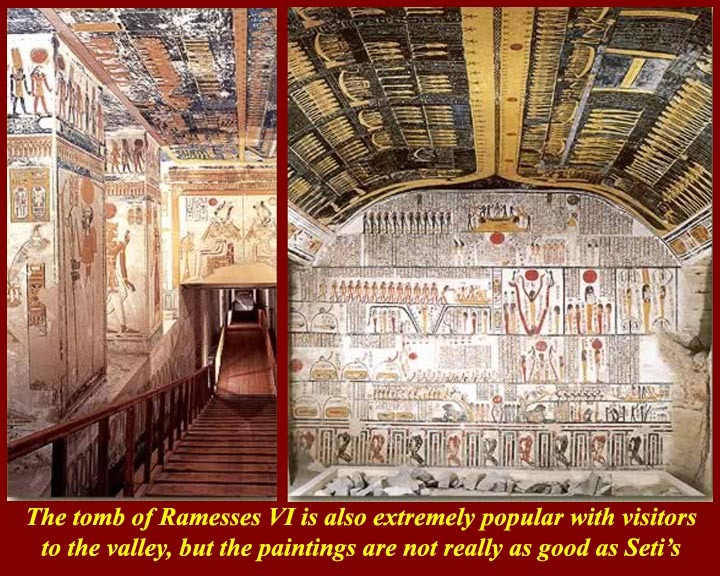 The last two images represent how the Nefertari tomb paintings looked before and after restoration. 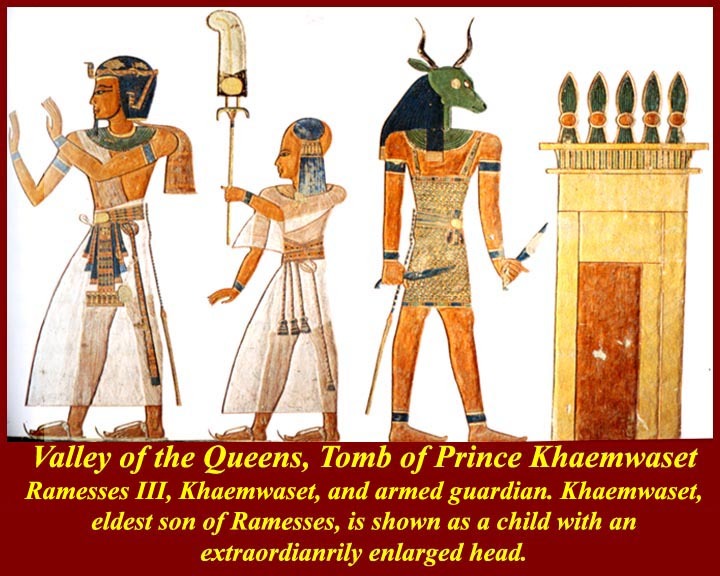 Khaemwaset was the eldest son of Ramesses III but he is sometimes misidentified as the son of Ramesses II, another Khaemwaset. His tomb paintings show him as an adolescent (wearing the characteristic child's topknot) but with royal attributes and being led into the presence of the gods by his father. 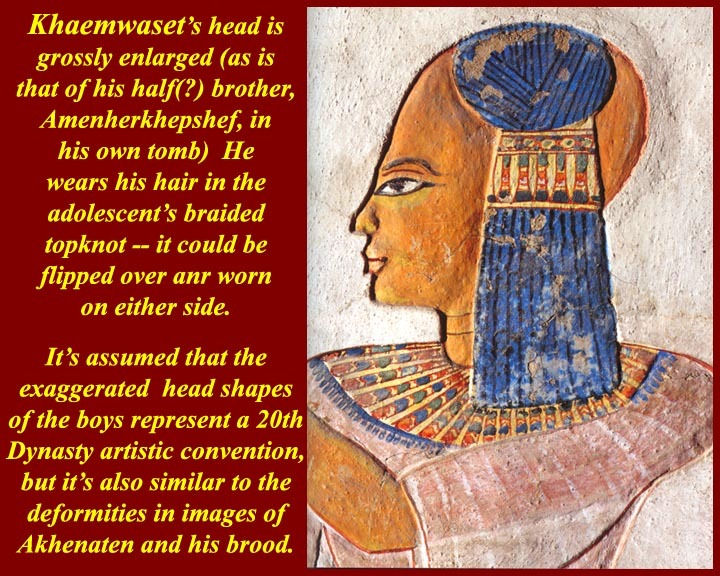 He (and his brother Amenherkhepshef in his own tomb) are shown with grossly enlarged heads, usually ascribed to artistic convention, but reminiscent of the distorted depictions of Akhenaten and his brood. 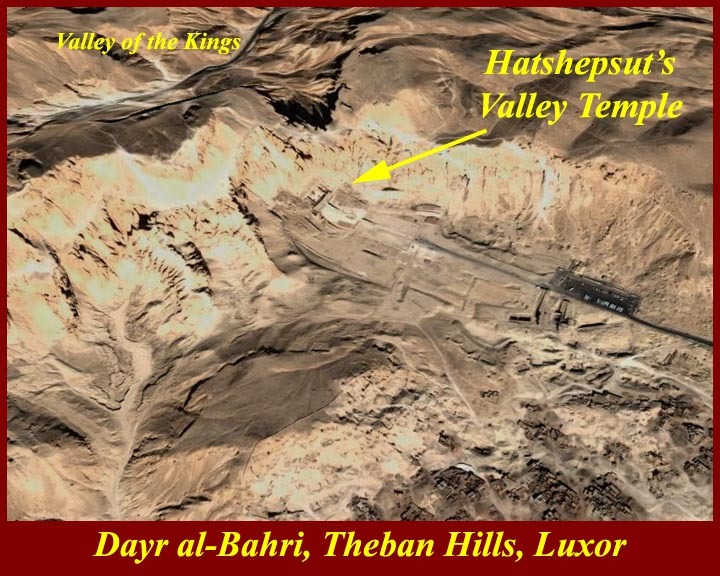 For information on the tombs of the two young sons of Ramesses III in the Valley of the Queens, see http://www.touregypt.net/featurestories/khaemwasett.htm and http://www.touregypt.net/featurestories/Amenherkhepshef.htm. 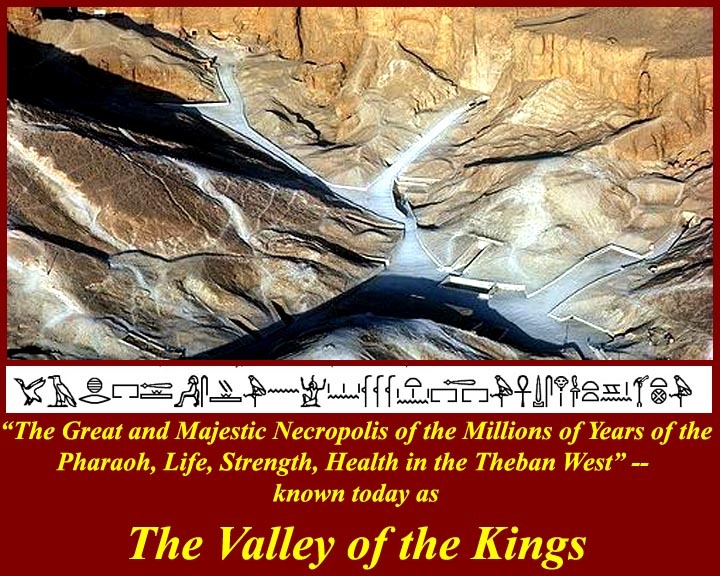 The Valley of the Kings has fascinated travelers since ancient times. 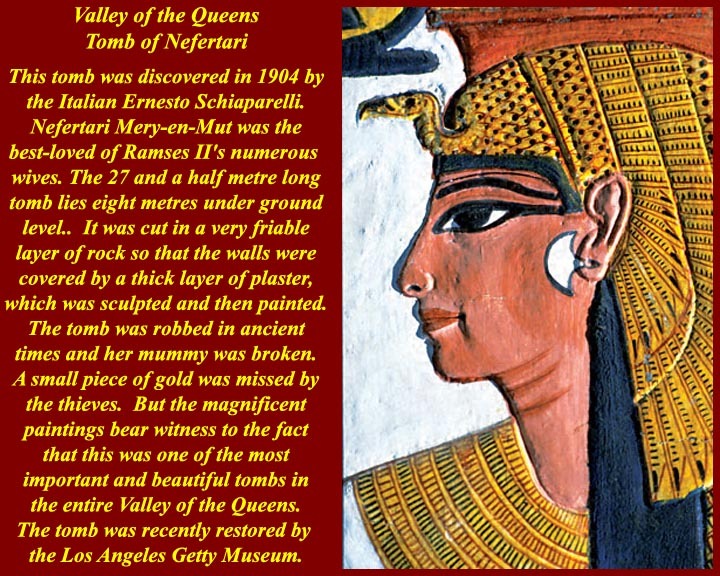 Ancient Greek and Roman sources already knew of at least ten pharaonic tombs in the valley -- and knew that the tombs had already been looted. 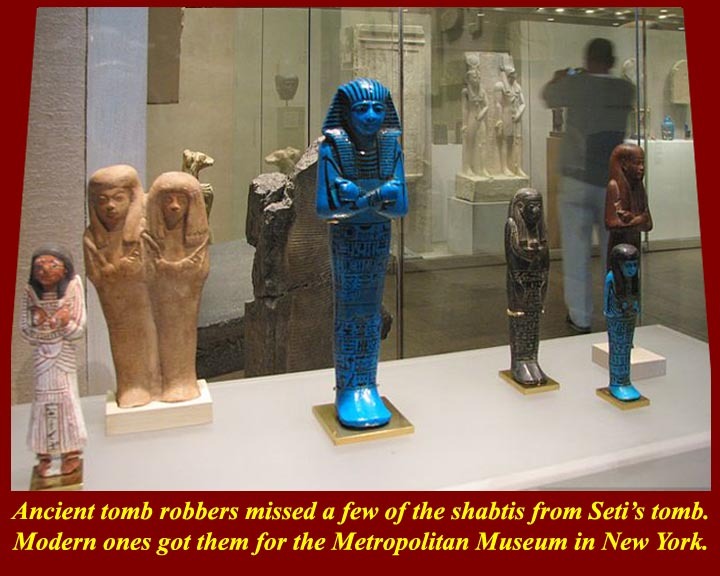 The local population, of course, knew of more, but they kept them secret because they were still removing and selling to foreign travelers and adventurers the few small artifacts that the ancient looters had missed. 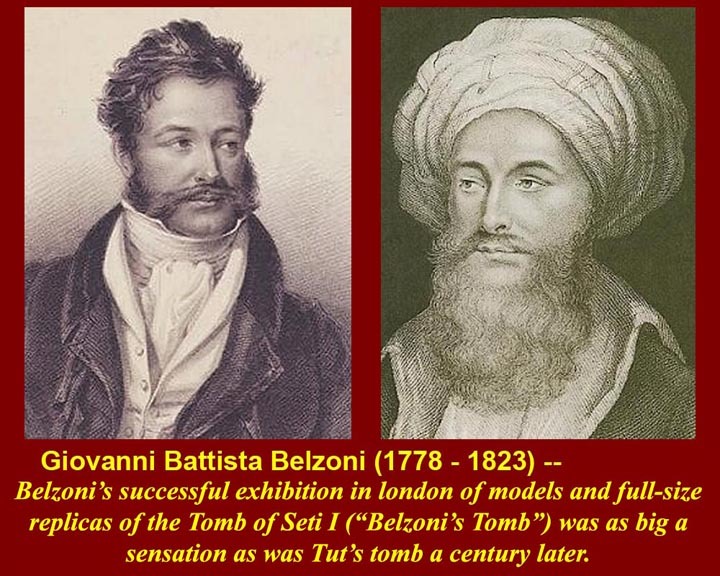 Giovanni Belzoni, exploring for the British, was aware of the ancient descriptions when he became the first modern European to explore the valley beginning in 1817. 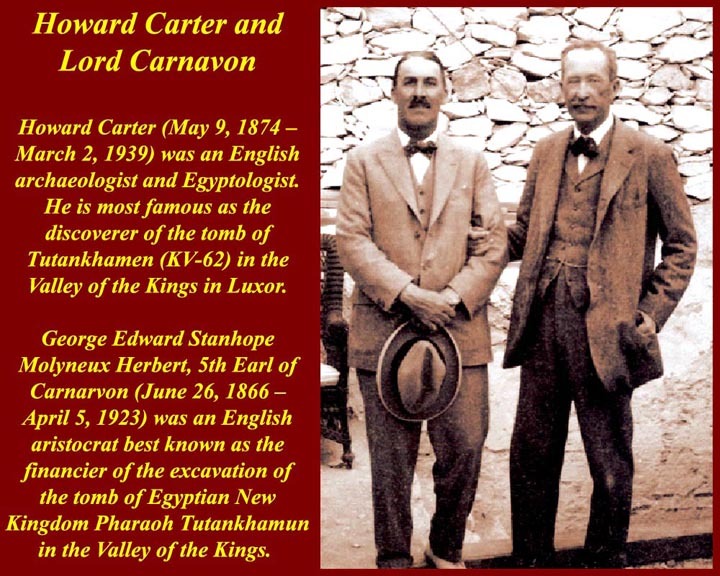 We are now in the third century of popularization of the Valley of the Kings, and these are the men who have/had the most influence on keeping the valley before the eyes of the anxious public: Zahi Hawas (no longer head of the Supreme Council of Antiquities but still often on TV), Howard Carter (with Lord Carnarvon), and Giovanni Belzoni. 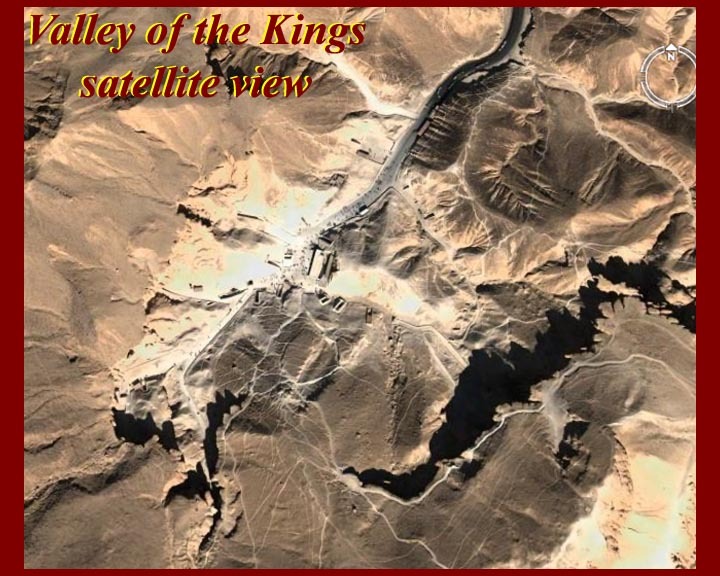 Satellite view and corresponding map of the Valley of the Kings. 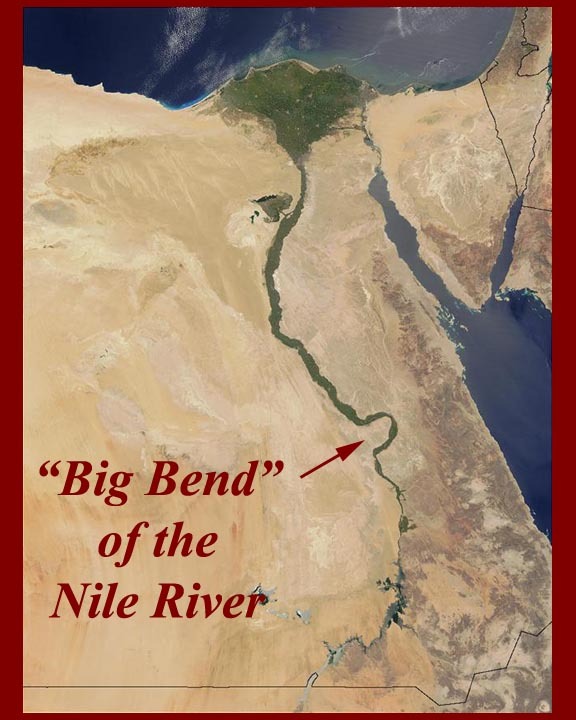 Tut was an insignificant pharaoh and his tomb is also "nuthin special". Nonetheless, it always attracts the biggest crowds, hoping to see all that gold. 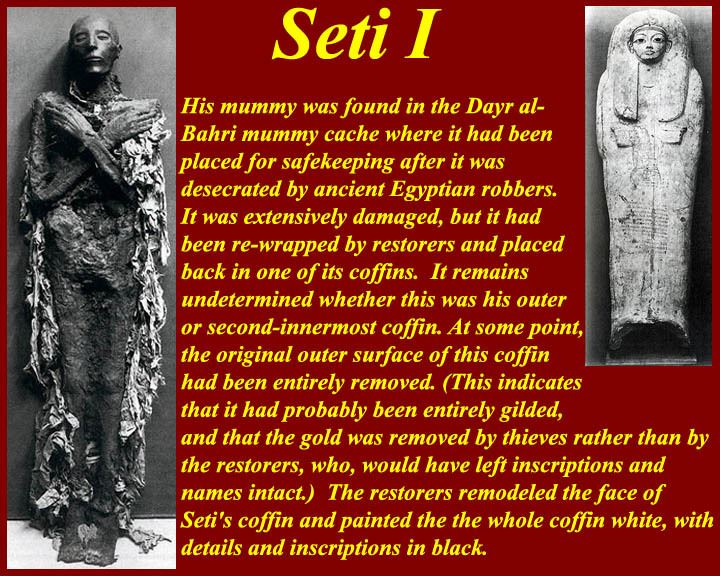 But the gold (if they did any research) is in the Egyptian Museum in Cairo -- or on tour in Europe, Japan, or the US. The artifacts really are impressive. They're just not here. 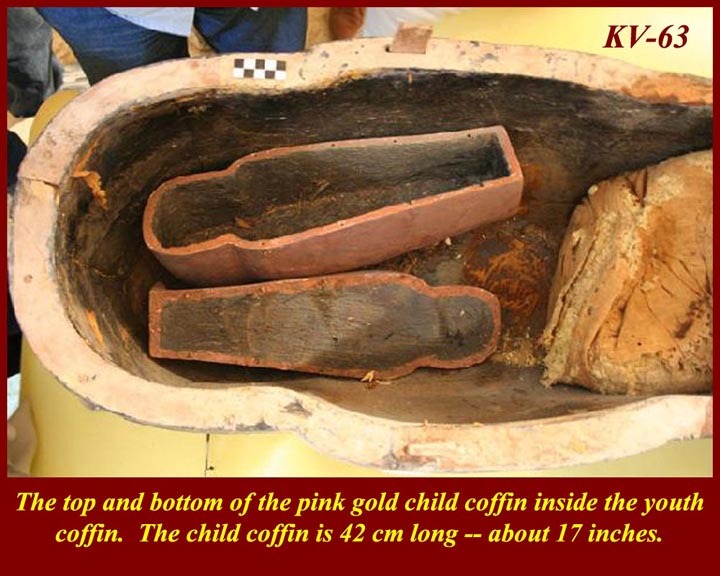 Tut, on the other hand, is here in his sarcophagus and in his closed coffin again after being CT scanned to try to determine his cause of death. 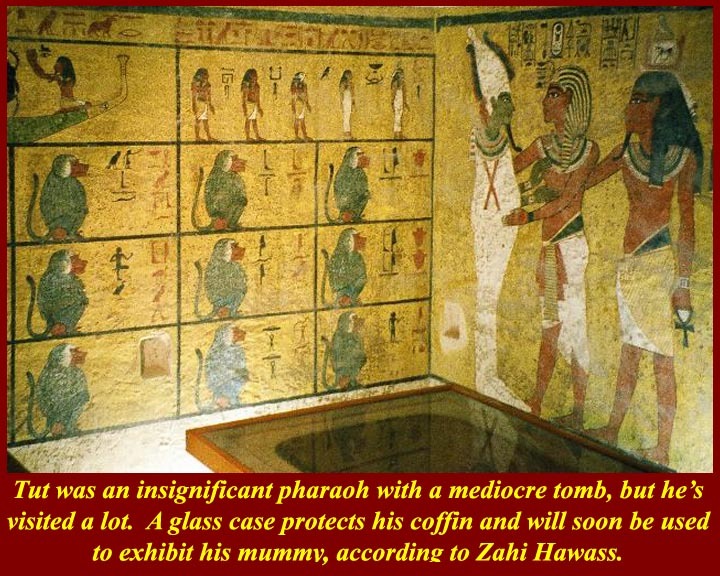 Tut is still in his tomb sans (coffin soon) covered to his neck with a plain white sheet out of respect for the dead. 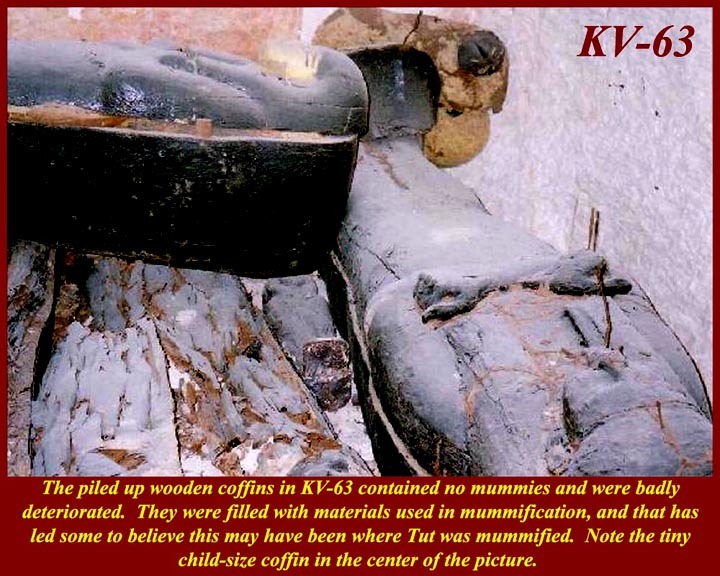 Mummies like Tut are really ugly -- my daughter once described one as human jerky. 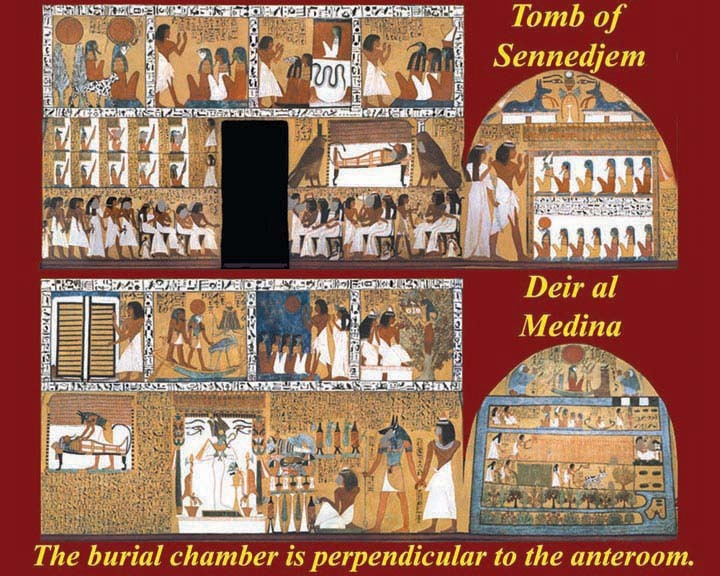 With or without the coffin, Tut and his tomb are not worth the price of the extra ticket you have to buy to enter nor the time you would probably have to waste in line. 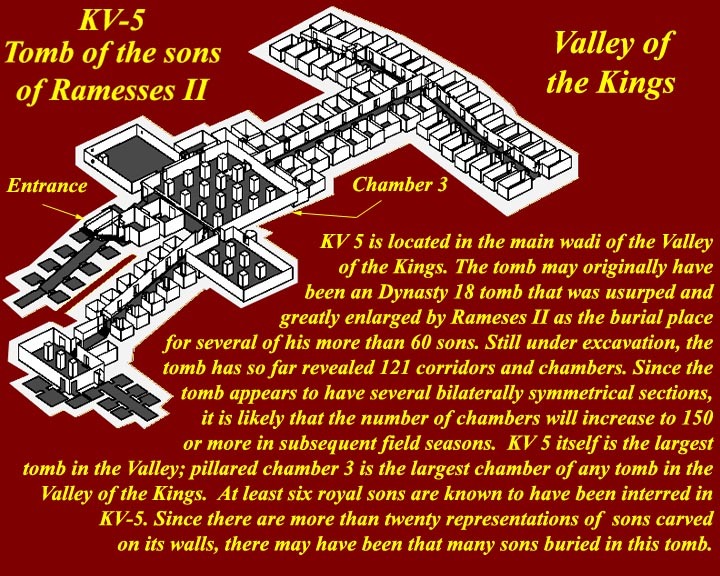 The tomb that everyone will want to see when it opens to the public (in a few years -- it's still being excavated) is KV-5, the tomb now identified as being that of many of the sons of Ramesses II. At least 120 rooms have been identified thus far although only about 10% of them have actually been cleared. 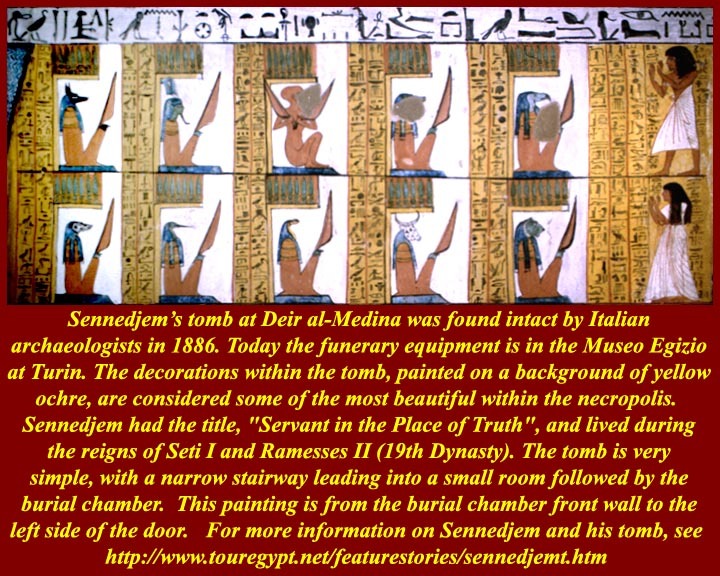 Since the tomb seems to have been dug on a symmetric plan, there should be a few dozen more rooms yet to be found. 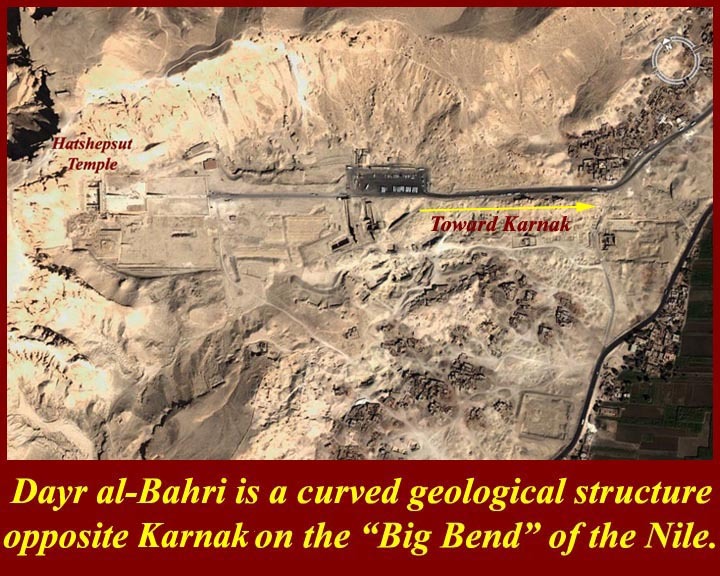 It is, in fact, possible to take a peek inside to see the excavations in progress, but only if you have the price of the annual Theban Mapping Project Fund Raising Tour: $6895 plus international air fair (call 800-480-3385 for details). 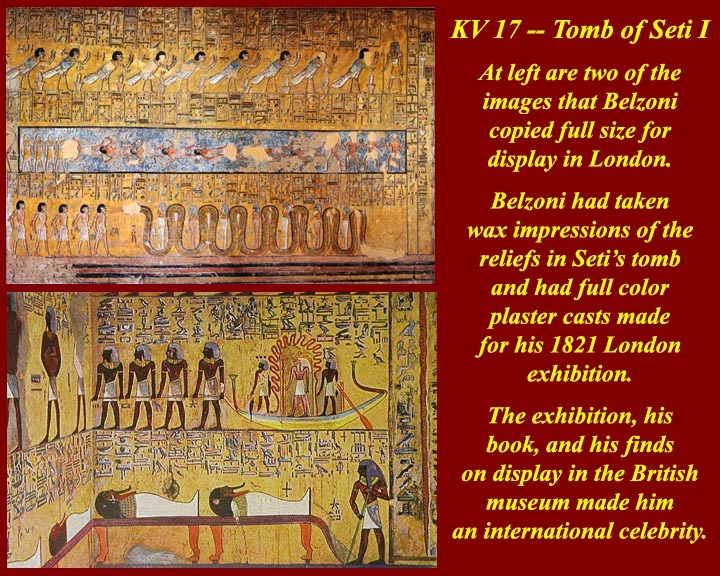 Belzoni made wax impressions of the painted reliefs in Seti's tomb (thereby damaging them) and from them made full size painted plaster models, which he displayed in London and Paris. 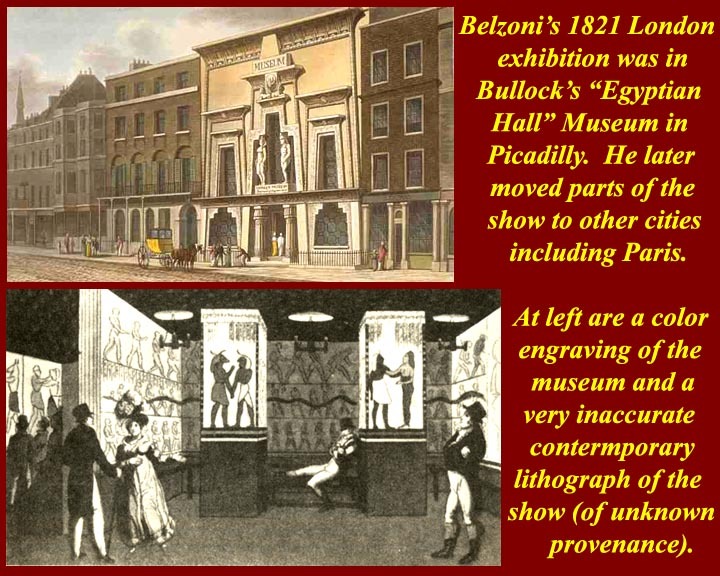 The London show was particularly successful and it, along with the book of his travels and adventures (Narrative of the Operations and Recent Discoveries in Egypt and Nubia), and with the "Young Memnon" (Ramesses II) head that he had delivered to the British Museum, made Belzoni a social lion. 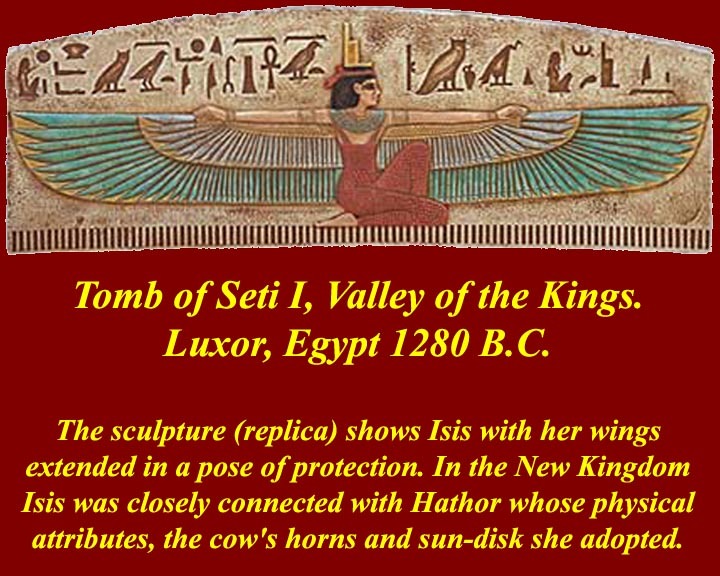 Images and artifacts from Seti's tomb. 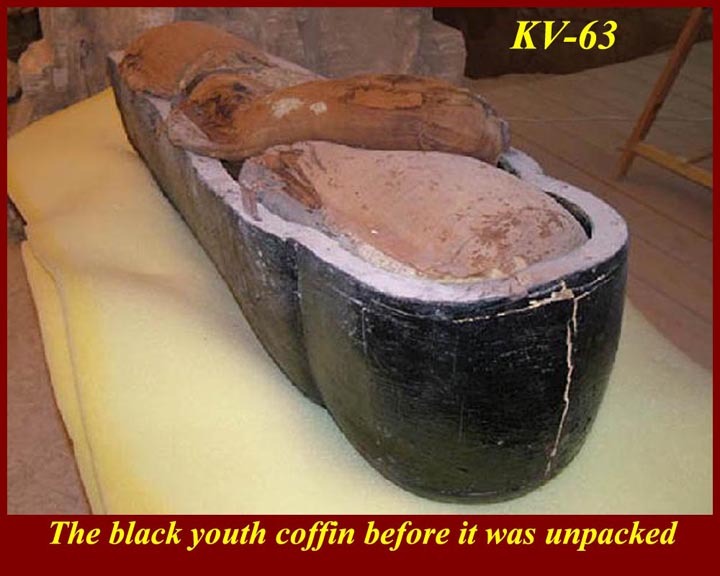 His mummy, which was one of the ones that had been desecrated by thieves and later re-wrapped by priests of Amun from Thebes, was found along with others in a cave in Dayr al-Bahri that is now known as the Dayr al-Bahri mummy cache. 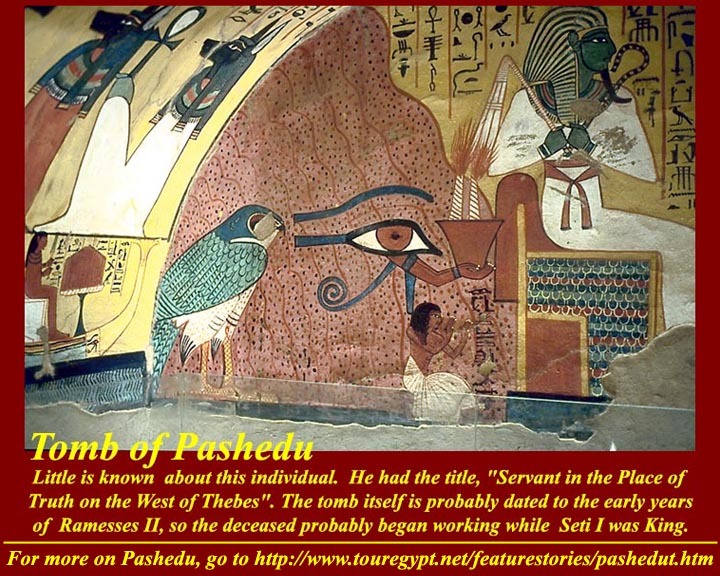 Another tomb worth a visit in the Valley of the Kings is this one of Ramesses VI. 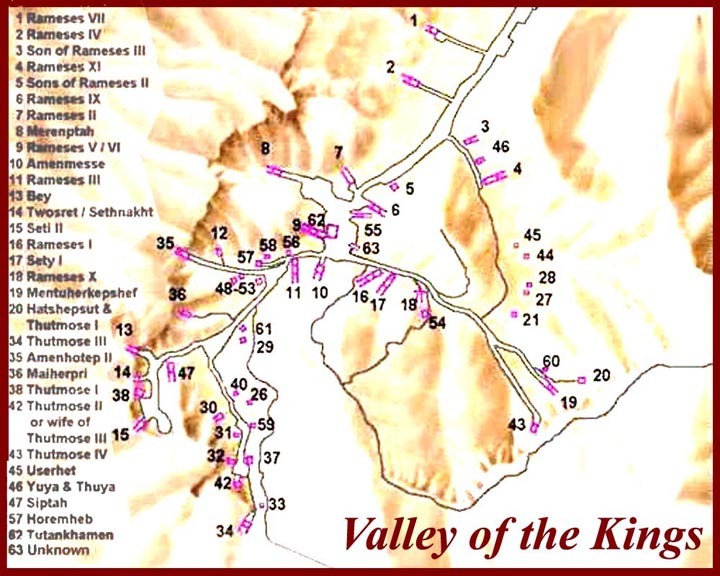 For more information visit the Theban Mapping Project website, the largest Egyptological site on the internet, which has complete coverage of the Valley of the Kings in images, text and maps: http://www.thebanmappingproject.com/. 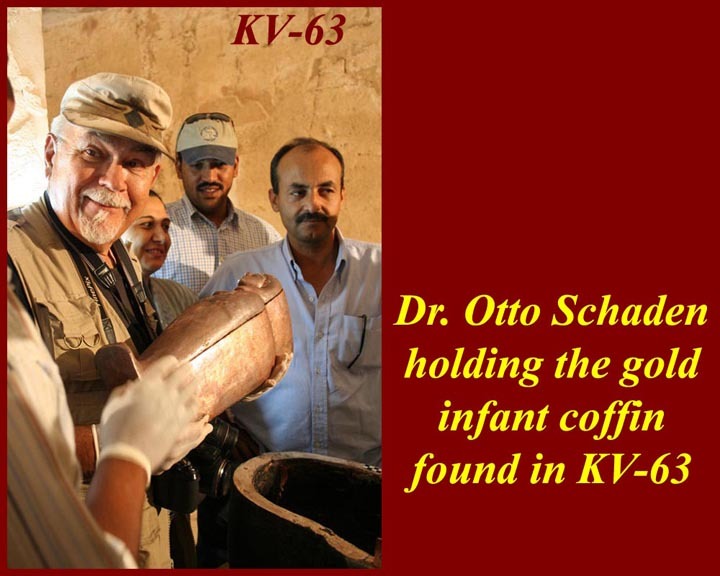 Recent developments: KV 63, near the tomb of Tutankhamun, is the most recent discovery in the valley. 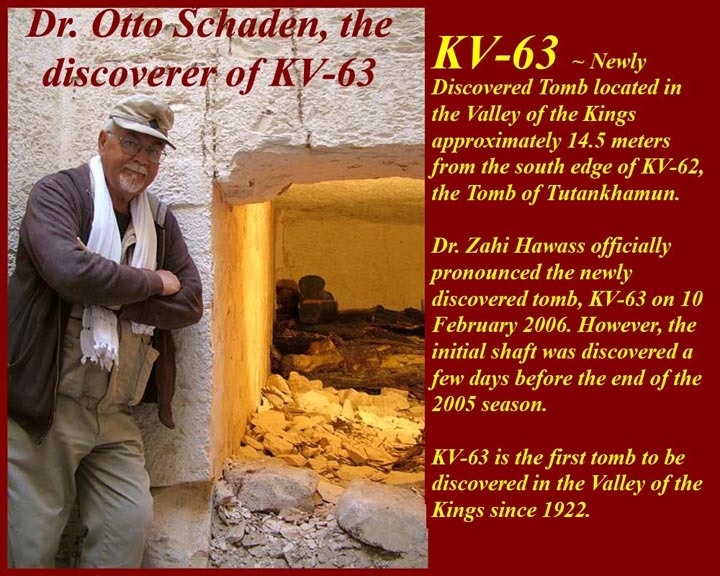 Zahi Hawas officially pronounced the newly discovered tomb on 10 February 2006. 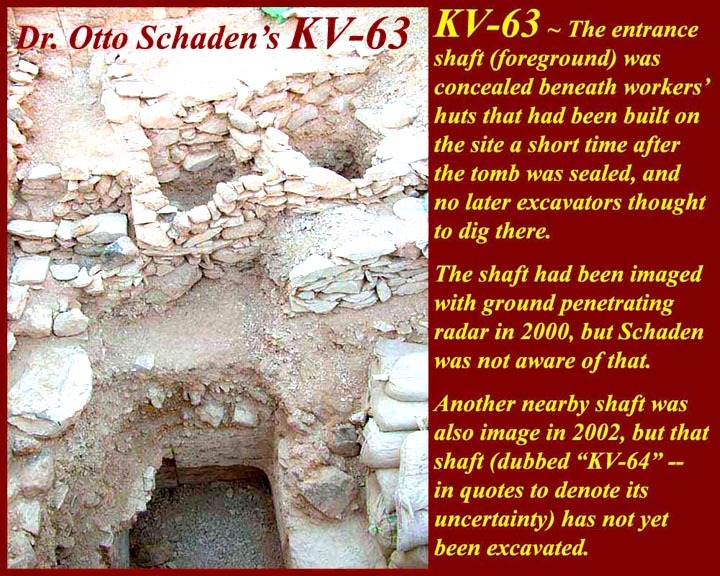 However, the initial shaft was discovered a few days before the end of our 2005 season. 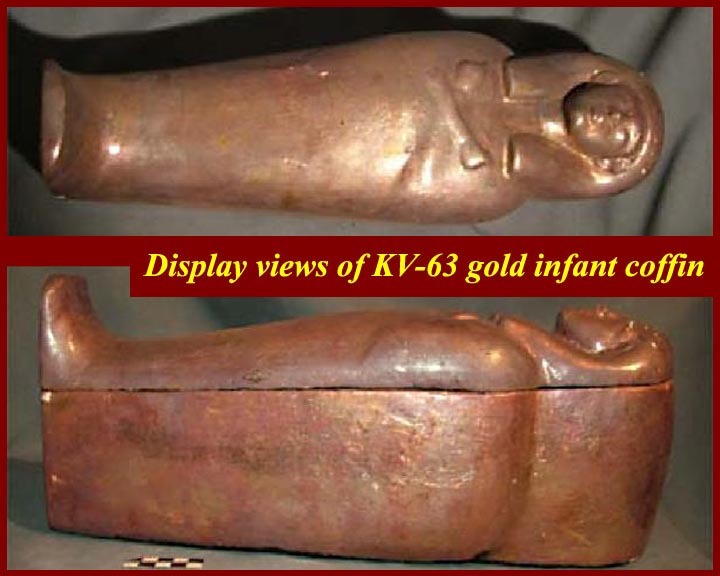 KV-63 is the first tomb to be discovered in the Valley of the Kings since 1922 when Howard Carter discovered KV 62, the Tomb of Tut. Everyone was greatly disappointed that Schadden's "tomb" turned out to be only a storage space for mummification supplies and excess coffins. 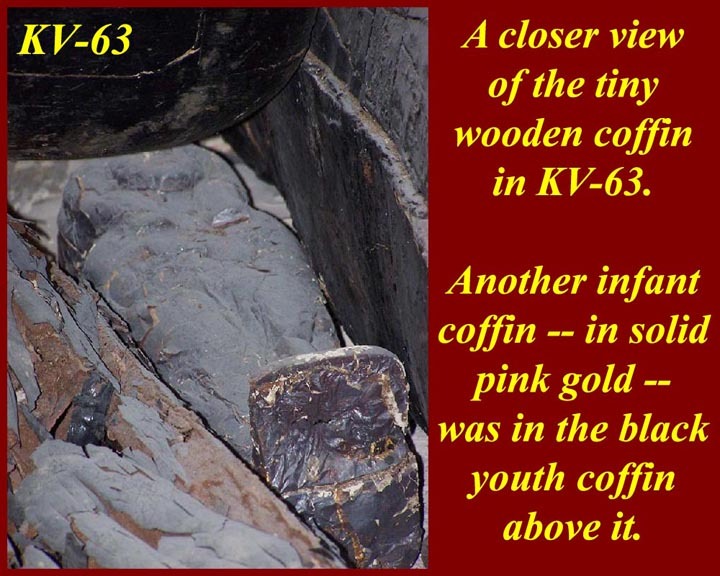 Even the infant coffin, which was initially reported as being "solid gold" proved to be wood covered with gold leaf. 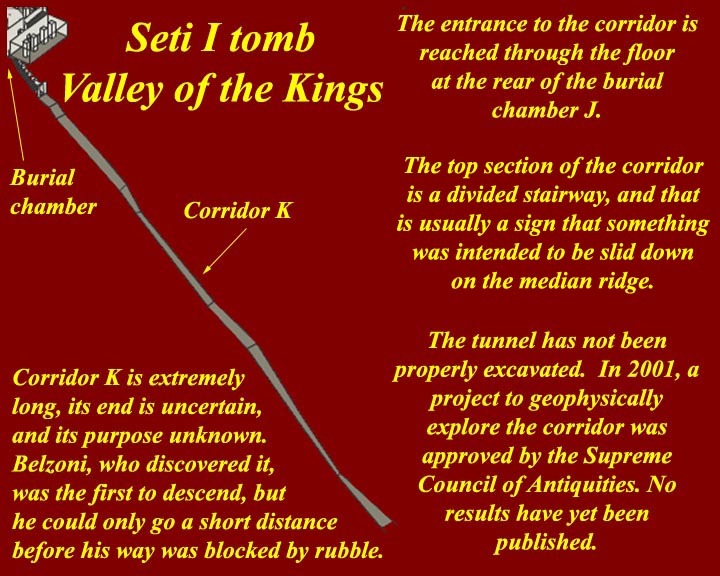 The most significant find was the "tomb" itself, because it showed that the Valley of the Kings was not, as had been thought, fully explored. 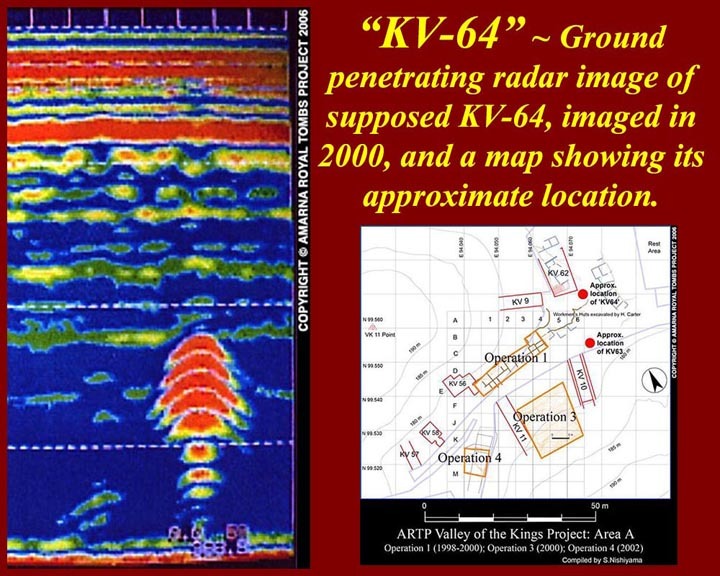 The KV 63 internet site is at http://www.kv-63.com/. 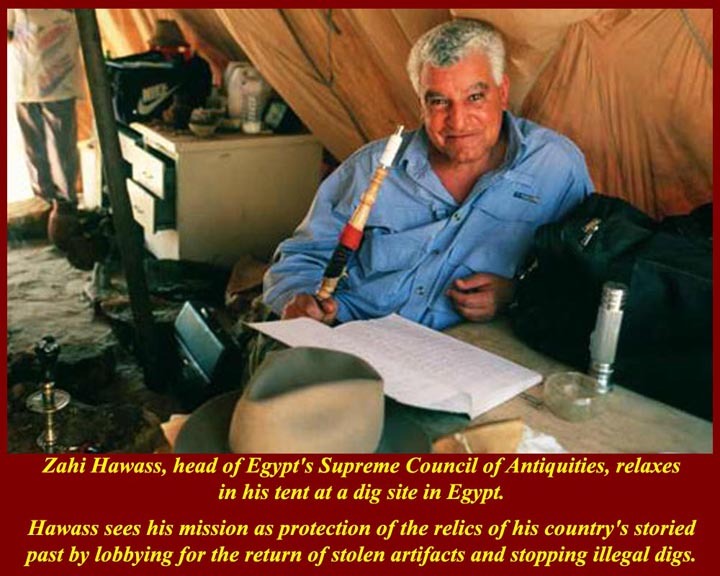 and at http://www.valleyofthekings.org/vofk/, and at http://www.archaeology.org/online/interviews/reeves.html.